For fans of wrestling, perhaps the most eye opening section recalls the now defunct World Championship Wrestling (WCW) promotion in the 1990s. At the time, WCW was a serious rival to World Wrestling Entertainment (WWE), now the only game in town. But while winning the ratings war, the behind the scenes politics and personalities that dominated the shows kept guys like Jericho from ever getting a chance to shine. So, in the chaos and confusion, Jericho started creating his own ideas for goofy and fun matches where he challenged Bill Goldberg, then the biggest name in the league, only to have a midget with the same name come to the ring. He claimed to be the master of a thousand and four holds, and then took the mic in the ring to demonstrate the awesomely boring “hold number 567: the wrist lock!” as if it were as deadly as a power bomb. The fans dug his personality, his serious talent, and humour. And the best “workers” in the back loved to work with him. But the power players all thought Jerich, who only clocked in over two hundred pounds, was merely a “vanilla midget” in a game of giants, and chastised or ignored him. So Jericho ignored them, their career-suicide advice, and cut his own way to the top when he joined WWE. 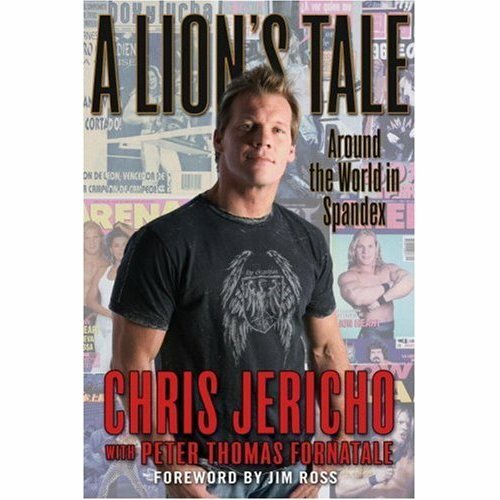 A LION’S TALE is a crackerjack memoir of growing up, sacrificing for your dreams, and enjoying yourself along the way. Jericho survived dangerously stupid youthful adventures, learned quick, and surmounted some rather awful personal tragedies that might have broke lesser fellas. His passion for wrestling and his first class sense of humour meld oddly with his faith, another aspect of his life that he’s proud of. This memoir, which you will devour in fast clip, will give you one of the best young man adventure stories ever told, and it’s all true. Well, as true as pro wrestling! Unless you’re afraid of rude words, I’d recommend this book to anyone interested in a rollicking true story in the unbelievable world of pro wrestling.